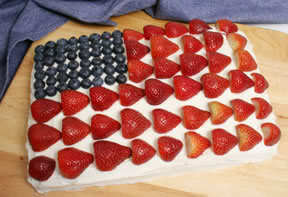 This photo is a USA Flag Cake ... They are very versatile for football matches, and other holiday festivities around the world. This one is made with fresh blueberries, strawberries and whipped cream. This is my 1st photo attachment ... It just took me 2 hours, to figure it all out. Sorry, the Vet scanned it too tiny ... However, practice makes purrfect ! Very nice, Margi! I made one like it years ago for DH's birthday, I used raspberries. Thanks and Happy July 4th to you and DH ... and of course, the lovely canine mascot. This isn't actually a cake, it is Jello with strawberries and covered with whipping cream and strawberries. I have done the same design on cake but don't have a picture. Your Canadian flag jello looks spectacular. Enjoy ... Thanks for posting ur photo. This is my 1st photo posted with a little help from Lucky Trim. Wonderful, LP! Happy Canada Day! I find it quite exhausting to not be able to just publish our photos in same way as our albums ... directly ... We seem to have to go through a daunting process. I am sure, that your cake was delicious anyway !